NASA has published a series of images captured by its TESS space telescope’s cameras. These are the first scientific images, that in jargon are called the first light, obtained on August 7, 2018 after the instrument testing period and show the southern sky. The images portray an amount of stars and other objects among which systems where exoplanets were already found. However, the main goal is to discover new exoplanets. Launched on April 18, 2018, the TESS space telescope took several weeks to reach its final orbit and more weeks were used for its instruments’ testing. Everything went as planned so on July 25 scientific operations began to hunt for the tiny traces of planets passing in front of their stars. During its primary mission it will observe a number of sectors of the sky but there will also be specific requests thanks to the TESS Guest Investigator Program, which allows scientists to obtain observations for specific research. Padi Boyd, a TESS project scientist at NASA’s Goddard Space Flight Center, stated that he and his colleagues were very pleased with the number of proposals received through the Guest Investigator Program and a selection was made for a wide range of investigations that don’t concern only exoplanets but range from distant active galaxies to asteroids in the solar system. In the meantime, however, TESS operations needed to start to obtain the first images and now the first views of the southern sky were revealed. They include parts of a dozen constellations and the Milky Way’s satellite dwarf galaxies called Magellanic Clouds, visible in the third and fourth panels of the image. In the third panel of the image, above the Small Magellanic Cloud there’s a small bright point, a globular cluster composed of hundreds of thousands of stars forming a sphere called NGC 104 or 47 Tucanae. 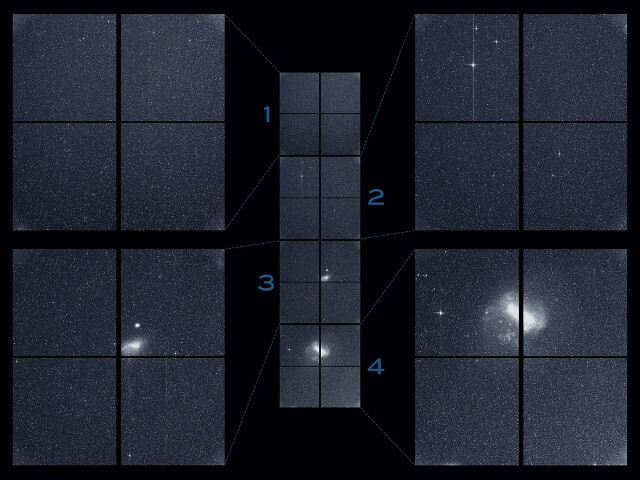 In the second and fourth panels, respectively, the stars Beta Gruis and R Doradus are so bright that they saturate an entire column of pixels of the second and fourth TESS cameras’ detectors, creating light trails. Every 13.7 days, the TESS space telescope passes at its closest point to the Earth and at that time it transmits the collected data, which are received by NASA’s Deep Space Network. At that point, it’s possible to begin the long processing of those data with the reconstruction of the images and in the case of the stars examined with the light curves to be analyzed to look for the exoplanet candidates. The candidates are then subjected to further examination and the confirmed exoplanets’ data can be published to allow astronomers from all over the world to proceed with follou-up observations. While waiting for the James Webb space telescope to be launched at last to study among others the exoplanets discovered by TESS, other telescopes can be used for this purpose. The Kepler space telescope is reaching the end of its mission because it’s running out of fuel but its legacy is safe and indeed with TESS a new era has begun in the hunt of exoplanets that will continue for years.